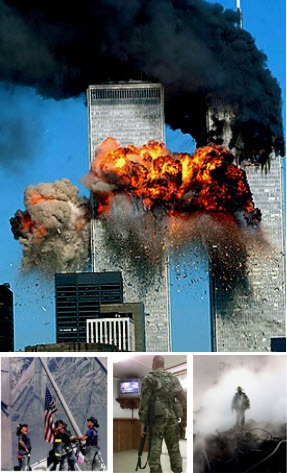 On September 11, 2001, our nation was attacked by terrorists. More than 3,000 innocent people were killed who were coworkers, friends and family members. While it was mostly Americans who were killed in this horrific attack, there were also 327 foreign nationals.To all of us, they were heroes. We shared the pain of watching the twin towers fall. We all knew in that moment that our lives had been changed forever. We also witnessed the courageous acts of the FDNY, NYPD, NY/NJ Port Authority Police and EMS individuals in the face of these unspeakable horrors risking their lives to save others. That courage and heroism continues for all those fighting the war on terror today. 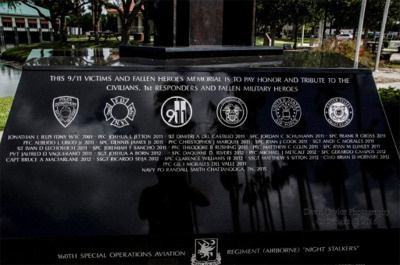 VENICE, Florida – In 2001, America was attacked by a small group of terrorists -- some of whom lived among us in places like Venice and Nokomis, Florida. 12 years later, a piece of one the towers they took down is being used as the Center Piece for the Memorial to help us never to forget . 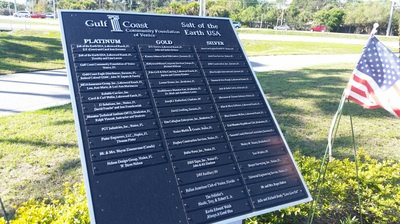 The 9.11 Victims and Fallen Military Heroes Memorial is intended to remind visitors to the Memorial of the the impact of events of September 11, 2001 on the citizens of this great country and the extraordinary civic response that grew from this contemporary historic event. 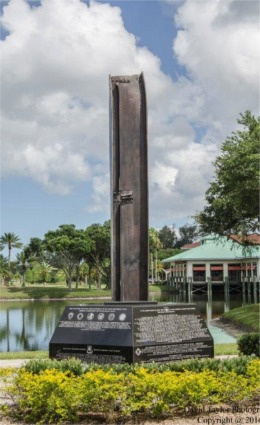 The 9.11 Victims and Fallen Military Memorial honors the more than 3,000 people killed in the terrorist attacks of September 11, 2001 and the 6,921 (as of July 26, 2018) US Military Servicemen and Women who have been killed in Operation Iraqi Freedom and Operation Enduring Freedom. 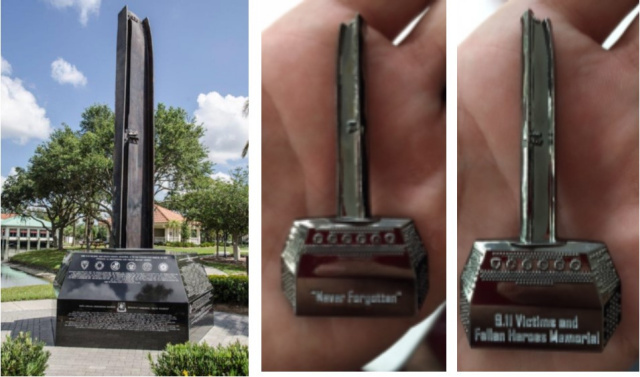 Over five (5) years ago, we engraved the names of The Benghazi Four, Ambassador J. Christopher Stevens, Sean Smith, Information Officer, Glen A. Doherty, Former Navy SEAL, and Tyrone S. Woods, Former Navy SEAL. 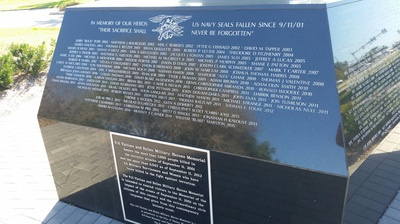 We have also engraved the names of 98 Navy SEAL's, two (2) of which are recipients of the Medal of Honor, including the 17 Navy SEAL's who were killed on August 6, 20155 Extortion 17. 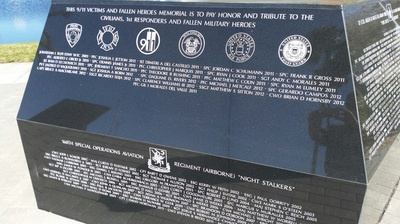 We added 47 names of the 160th Special Operations Aviation Regiment (SOAR) Night Stalkers. We have added the names of the seven (7) US Navy Sailors who were killed on the USS Fitzgerald, June 17, 2017, we also added the 15 names of the US Marines and one (1) US Navy Corpsman who were killed in a KC-130 crash in Leflore County, Mississippi, on July 10, 2017. 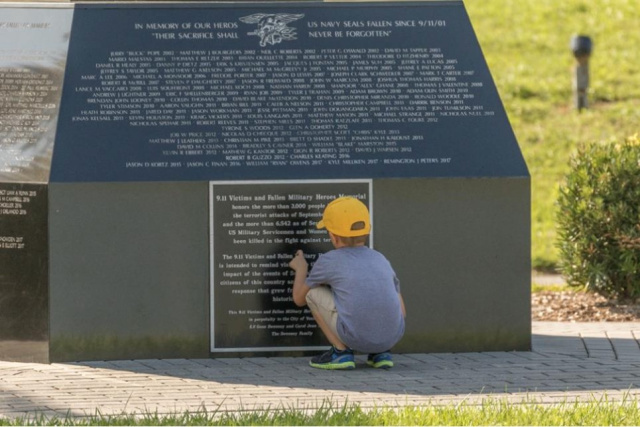 We engraved the name of Christopher “Scott” Chris Kyle, Former Navy SEAL-The Greatest Sniper in U.S. Military History, who has also been added to the wall. Also please go to our Facebook Page and LIKE us. available for a Donation of $50.00. This beautiful hand-crafted limited edition 9.11 Memorial Medallion is a remarkable replica that truly reflects the quality and craftsmanship befitting the nobility of the cause. Get your cherished keepsake while supplies last!